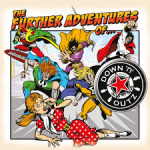 Share the post "Album review: DOWN ‘N’ OUTZ – My ReGeneration/The Further Adventures Of"
The Down ‘N’ Outz were formed by Def Leppard’s Joe Elliott, when he was asked to be involved in the Mott The Hoople reunion shows in 2009. For this he was backed by Quireboys’ members Paul Guerin (guitar), Guy Griffin (guitar), Keith Weir (keyboards) and drummer Phil Martini (Wayward Sons) – current bassist Share Ross (Vixen) joined the band for their 2014 tour. Their two studio albums to date, 2010′s ‘My ReGeneration’ and 2014′s ‘The Further Adventures Of…’, have been re-issued by Frontiers along with a new release, ’The Further Live Adventures Of…’, a live 2CD/DVD and Blu-Ray. ‘My ReGeneration’ I first came across as it was given away with a copy of ‘Classic Rock’ magazine. Of the two albums this one is the most played as it has some fantastic runs through ‘Golden Opportunity’, driven along by a rollicking piano riff and ‘Overnight Angels’. ‘Shouting And Pointing’ and ‘England Rocks’ will have you hurling yourself around the place air guitaring or maybe that’s just me… The sheer enjoyment Joe Elliott and the band must have had whilst making this album comes through on the music. There is also the live version of Elton John’s ’Funeral For A Friend/Love Lies Bleeding’, clocking in at over eleven minutes, it showcases the band’s undoubted musical talents as well as allowing Joe Elliott to tinkle the old ivories. ‘The Further Adventures Of…’ includes some bona fide classics like ‘Rock N Roll Queen’, which gets the album off to a flying start. Unlike the last album which included Ian Hunter and British Lion songs, this album’s twelve songs were all by Mott The Hoople originally. ‘Violence’ shows Mott The Hoople’s knack for penning memorable tunes, whilst the guitar playing on ‘The Journey’ is simply magnificent. ‘One Of The Boys’ even had some chart success on the US classic rock radio chart. Down ‘N’ Outz certainly produced two entertaining albums and tweaked your interest to track down the originals, as well as help highlight what a talented and underrated songwriter Ian Hunter is. This entry was posted in ALBUM REVIEWS, ALBUM REVIEWS (Mobile), All Posts, Reissues and tagged album, classic rock, Def Leppard, Down N Outz, Ian Hunter, Joe Elliott, live, Mott the Hoople, My ReGeneration, Quireboys, re-issue, review, the Further Adventures Of. Bookmark the permalink.